Item Number: 66-7-216 19158 Actual Weight: 2 lbs. Powder-free, long-cuff beaded gloves have textured fingertips to make gripping easier and more secure. Extended cuff protects wrist and forearm. Class 100 gloves have smooth palm with excellent tactile sensitivity. 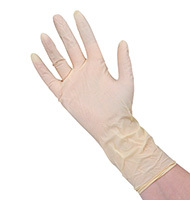 Gloves are double bagged in clean room polyethylene bags. Thickness at center of palm is 5.9 mil and fingertip is 7.1 mil. Helps meet OSHA requirements for exposure to bloodborne pathogens.